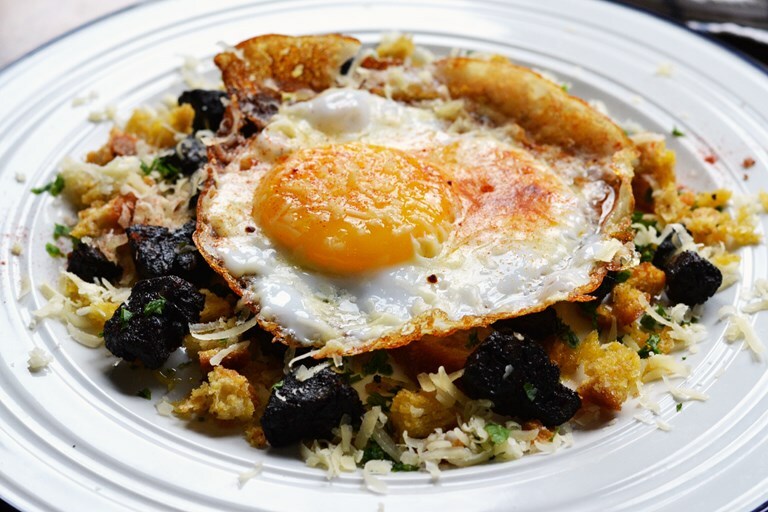 Danny Kingston serves up a dish of great beauty, combining earthy, mellow black pudding with crispy croutons and a wonderfully rich duck egg. Topped off with a scattering of nutty, mature Le Gruyère AOP 'Reserve', this recipe is as suited to a dinner party as it is a decadent brunch. When it comes to eating, some of our favourite dishes have their feet firmly planted at certain times of the day. Porridge lingers around 7AM. A ham sandwich strikes at midday. And fish pie, all bubbling underneath and golden on top, gets popped out of the oven at five o’clock in the evening and usually on a Friday (and sometimes on Saturday too). That is of course, if you live in my house. You may have variations on that theme but by and large, we are all governed by the clock dial and the types of food we consume. Which is an exceedingly boring way to do things and nothing makes me happier when I happen to stumble and conjure up a recipe that can be eaten at any time of day. For breakfast, lunch, tea or for midnight gorging, after a pint or two. What is even better is when you believe that a recipe can deliver both substance and panache. A dish that looks equally good when rustled up for brunch or for a smart dinner party. 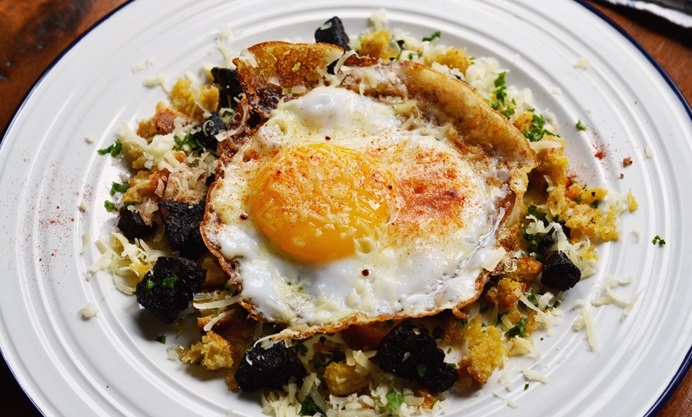 So after a drum roll if you please, ladies and jellyspoons, let me introduce you to the smashing combination of duck egg, black pudding, sourdough crumbs and a healthy handful of grated Le Gruyère AOP 'Reserve'. OK, it’s a fairly simple premise really, so perhaps I’ve over-hyped things a touch but uncomplicated food is often the best. Just take a bunch of quality ingredients and you can have a quality plate on the table in no time. 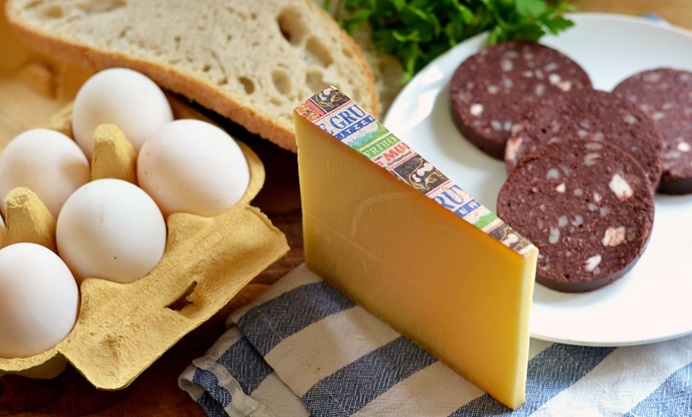 Make sure that your duck egg is nice and crispy around the edges, your black pudding contains a good amount of fat and the sourdough crumbs should deliver plenty of crunch for texture. 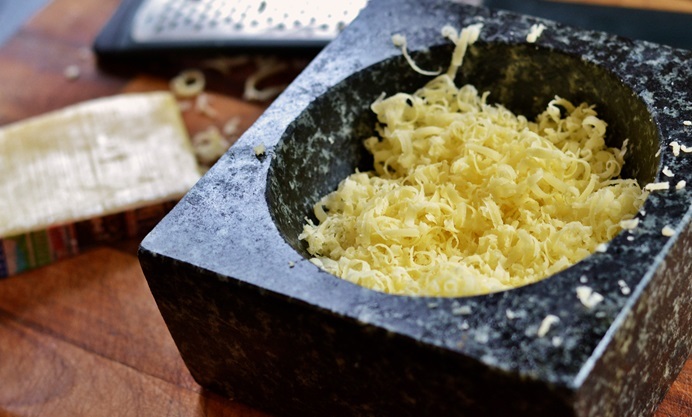 The mature Gruyère, raw, nutty and unfettered, will finish everything off, punching through plenty of umami flavour right at the end. Chopped parsley and a light dusting of smoked paprika delivers a final flourish for decoration, but they are not essential. The Fantastic Four do well enough on their own. Place into a bowl and mix together with the rapeseed oil, adding a touch of salt and pepper for seasoning. 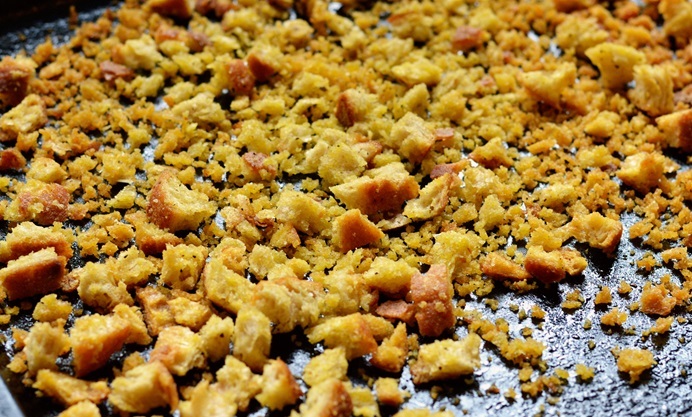 Now scatter the crumbs onto a baking tray, making sure that everything isn’t clumped together and bake for 12-15 minutes, until they are all crunchy and golden.